Transfuser 2 is a dynamic audio/MIDI environment for manipulating, slicing, and remixing your loops and sounds into something entirely new. With a series of real-time controls, Transfuser 2 lets you create and tweak grooves, chop up beats and phrases, time-stretch sounds, re-pitch notes, randomize sequences, and more – all on the fly. Transfuser 2 also acts as an inspiring compositional tool that intelligently generates chords, melodies, variations, and grooves based on a musical analysis of your track. 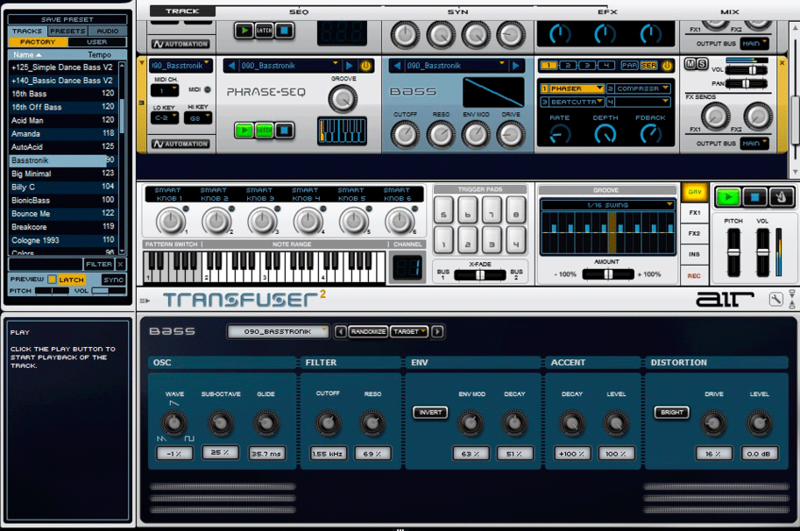 Plus, Transfuser 2 comes with a premium drum and instrument library that includes 3,200+ loops and 1200+ drum machine samples for instant music experimentation. 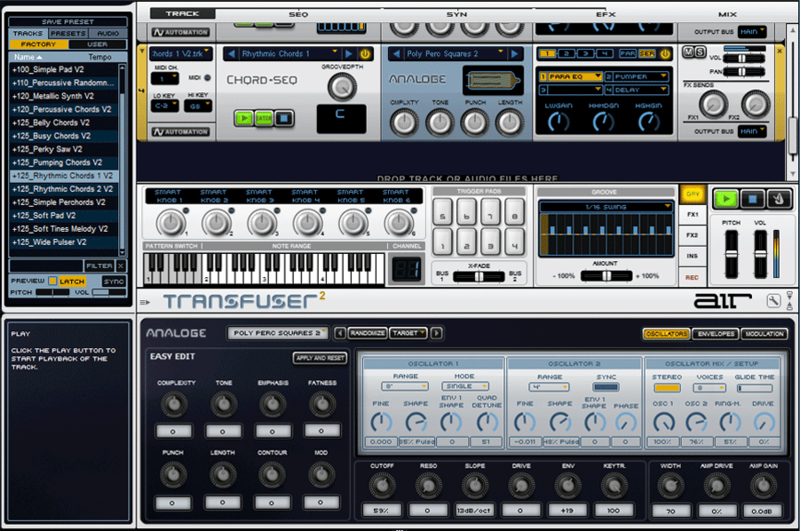 Transfuser 2 offers an array of innovative modules that inspire you to create music in ways you never thought possible. Use the Sequencer module to tweak the groove of a drum loop, vary notes in phrases, store patterns, alter the sequence speed (in relation with your session tempo), and more — in real time. A Poly Sequencer and Chord Sequencer send monophonic and polyphonic MIDI data, respectively, to any of Transfuser 2’s synthesizer modules. Use the Synth module to modify your sounds and shape the audio frequency, velocity, filter, attack, and decay. Transfuser 2 can manipulate a single loop or audio file, or apply its effects to a group of sounds. M.A.R.I.O., or Musically Advanced Random Intelligence Operations, is a powerful tool that analyzes your music to intelligently generate chords, melodies, and variations that complement your track. Use M.A.R.I.O.’s advanced algorithms to evaluate the musical characteristics of your song and search its smart tables to find similar or dissimilar (similarity is determined by the Variation settings) phrase styles and rhythms. M.A.R.I.O can also manipulate parameters such as the pitch, rhythm, level, filter, and more. With M.A.R.I.O., you can simply click to create inspiring melodies, compelling loops and sequences, or build up the accompaniment. Transfuser 2 also features an array of performance-drive features that enable you to trigger and manipulate your music on the fly. You can trigger a series of your own pre-sequenced patterns, or let loose and perform, arrange, and tweak grooves on the fly from your own MIDI keyboard or controller. 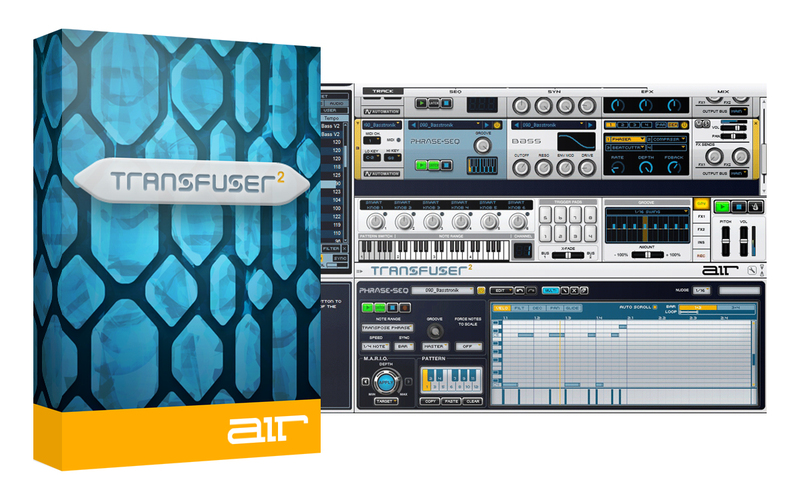 Transfuser 2’s offers seamless hardware integration, and its module and parameter controls, Smart Knobs, Trigger Pads, four-octave keyboard, and crossfader are completely mappable. 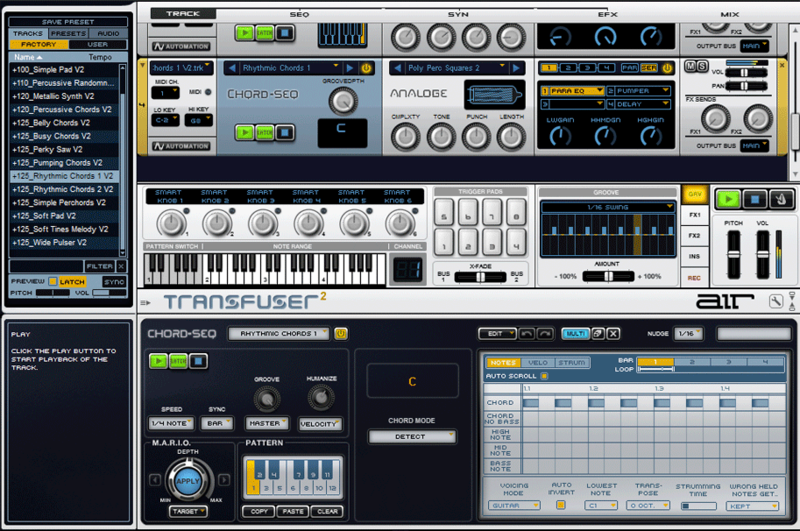 In addition to its real-time audio editing functionality, Transfuser 2 comes with an array of effects, instruments, and samples. Use the Effects module to insert up to four of 20 different effects per track, including Beatcutter, Tape Delay, Pumper, Compressor, Vinyl, Filter, Spring Reverb, Distortion, and Lo-Fi. 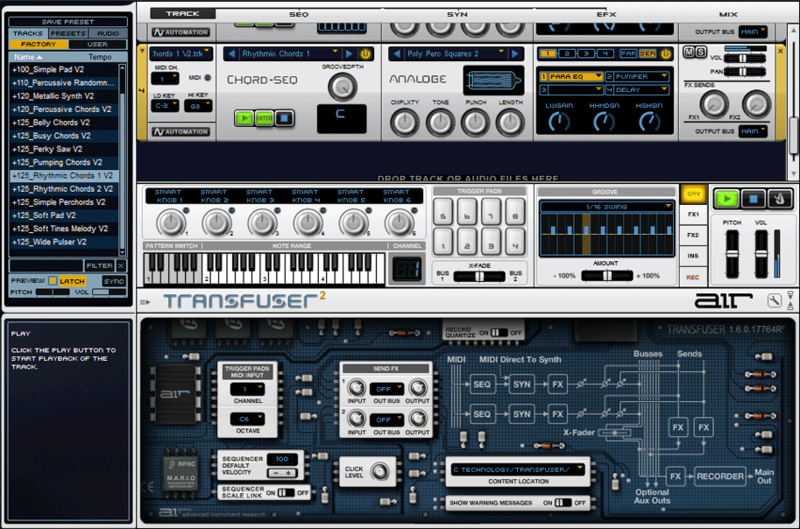 Transfuser 2 includes a polyphonic analog synthesizer and electric piano instrument for. 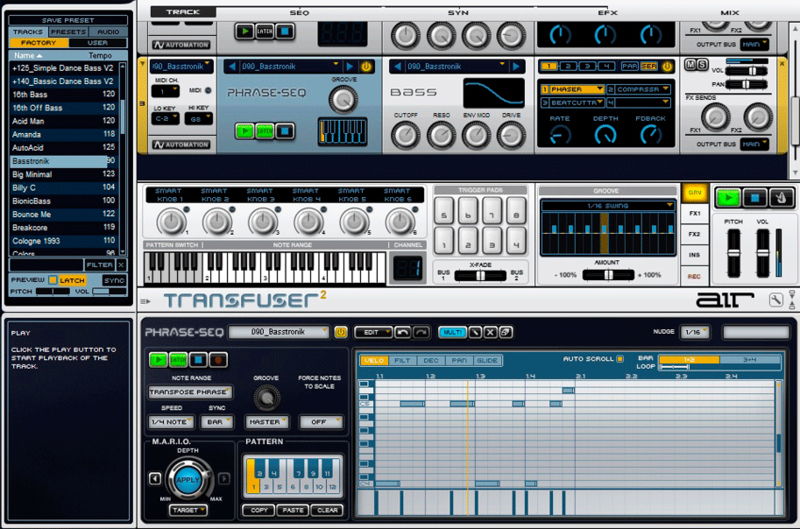 Transfuser 2 comes with 4.5+GB of loops and phrases that include beats, breaks, basses, acoustic and ethnic instruments, synth sounds, and more. You can also other sample libraries with Transfuser 2 by dragging and dropping your own ACID, REX, Apple Loops, AIFF, and WAV files onto its interface. AIR Music Technology is a trademark of inMusic Brands, Inc., registered in the U.S. and other countries. All other product or company names are trademarks or registered trademarks of their respective owners. Product features, specifications, system requirements, and availability are subject to change without notice. © 2019 inMusic Brands, Inc.